A group of narcissistic actors get together for a raucous party - only for the world to end at the same time. Trapped inside James Franco's Hollywood mansion, they must contend with a post-apocalyptic world of fire and demons while not turning upon one another at the same time. 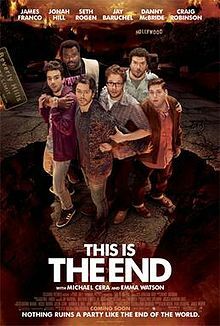 This is the End, directed by Seth Rogen and Evan Goldberg, feels like a genuinely inventive Hollywood comedy. It takes the assembled cast of a whole generation of recent comedies, including Rogen, Franco, Danny McBride, Jonah Hill, and others, and gets them to play ridiculous parodies of themselves in a disastrous situation. On the one level it's the ultimate in 'inside baseball' comedies, since so much of the humour depends on familiarity with the various and actors and their films. On the other it's a really fresh idea that is played out to wonderful extremes. Obviously comedy is particularly subjective, and if you do not enjoy the sorts of comedy films usually produced by the likes of Franco, Rogen or McBride you are unlikely to see much appeal here. If you're a fan, however, this is absolutely one of their best works. The film cleverly uses Jay Baruchel (How to Train Your Dragon) as its protagonist, since while he is a known performer he probably has the lowest profile of the key cast. This enables him to be much more of a viewpoint character, presented as someone who doesn't live in Hollywood and who does not engage well with its weird quirks and cultural attitudes. He is picked up at the airport by Seth Rogen, who seems pretty much identical to the majority of his on-screen characters, before they both head to Rogen's house to watch movies, play videogames and smoke a lot of weed. That night they go together to a wild party at James Franco's house. The party is a pitch-perfect Hollywood parody, with real-life actors and celebrities either playing broad parodies of themselves - such as Franco, Hill or even Harry Potter's Emma Watson - or deliberately inversions of their on-screen roles. Michael Cera, for example, who generally plays meek and awkward nerds, turns out to be a drug-addled over-sexed libertine. While making a quick run to a nearby convenience store, Rogen and Baruchel witness the beginning of the Biblical Rapture. People are sucked into the sky via beams of brilliant blue light, while on the streets lava begins to explode from the ground and the entire population of Los Angeles goes berserk. Back in Franco's mansion no one initially notices that the world is ending: an ultimate attack on Hollywood self-obsession. The shift from Hollywood satire to apocalyptic comedy is a sharp and sudden one, and gives the film a huge boost of energy. The remaining hour or so is raucous, bold, gross and insanely silly. Characters are pushed to ridiculous extremes. Cameos abound. Not everybody makes it out alive. The film is hugely impressive in how it has combined two strong concepts and then committed to them one hundred per cent. There is so much going on: people confessing their true feelings, terrified actors turning on one another, and narcissists who spend their lives feeling immortal suddenly having to face their imminent demise. There's an argument that, in the end, it's all an excuse for a bunch of knob gags, and to an extent that's a fair assessment - but they're great knob gags, and they're really inventively put together. This is the End is a hell of a lot of fun, and if you take a step back in and view with a critical eye it is impressively creative and brilliantly put together as well.